Respect for others « God is Good! Before the days of my entry into the technical world of publishing, and establishing my Blog, my message was type written as a Bulletin for the Midway Airport Chapel, which I founded. I would create the Bulletins on my computer, and then bring my masters to the local Office Depot for printing. On one such day, the usually cheerful clerk took them with a troubled, sad face. Suddenly, tears started running down her cheeks. “People are so rude”, she exclaimed. Evidently, that morning a person or two had hurt her feelings with ill-chosen words or actions. Unfortunately, as an employee of the store, the young clerk could not retaliate with her true feelings. Swallow the rudeness or lose one’s much needed job. A single mother, raising two adolescent children, she had allowed herself to be the target of unloving people. Rude people lack self-esteem with an attitude of anger and frustration towards life. Maybe, a childhood, empty of much true family love, had crippled their minds and hearts from offering respect to others. They are crying out in their hearts for love while oftentimes trying to destroy the spirit of love in others. Something cowardly in all this! These troubled souls resent people with serene and cheerful ways. Sometimes, out of control, rude people will lash out with cutting words and angry looks to rob others of their happy appearances. Service people are helpless to answer back and become prime targets for these predators of the heart. The women traffic guards at Midway Airport would frequently tell me of the poor treatment they received from the public. It is not much different for others in the service industry – wait staff at restaurants, store clerks, order takers behind the counter at your favorite fast food place, nurses, aides, and receptionists – all seem to face the brunt of these rude people. 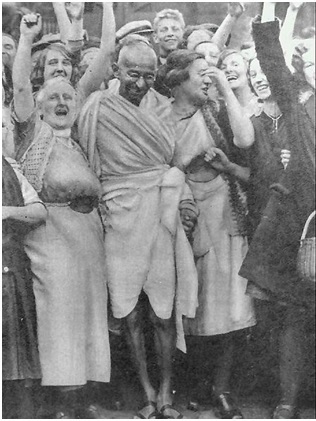 Courtesy, good manners and mutual respect should mark our present generation different from the Stone Age where brute force ruled. Consider the words, “thanks”, and “please” as keys to another’s heart. Be in love with ourselves so much that we want to share that love with others. Personally, at nightfall, the graciousness of others to me that day gives me hope to on living. 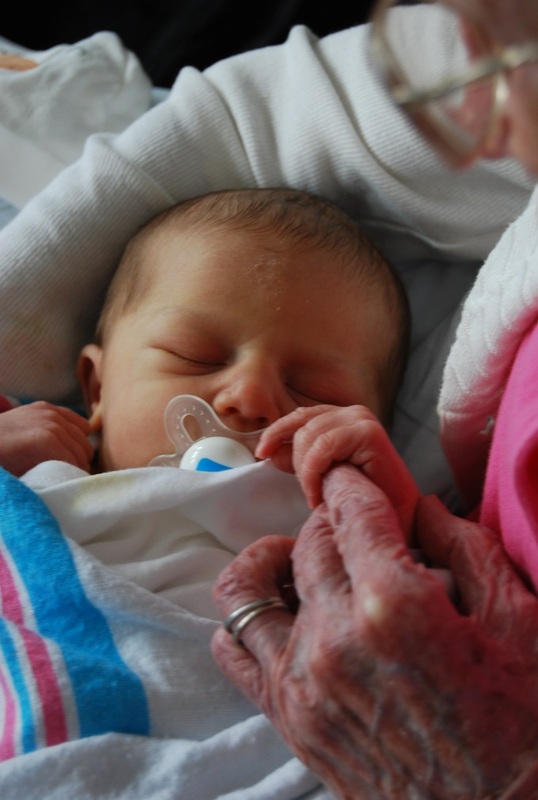 Grace, my second Great Grand Niece, tenderly holds her Great Grand Mother’s finger. We all started off in the same place in our lives. Life is precious and a gift and we can’t let ourselves get so mad or depressed that we forget that. Everyone is important to someone. This past month we had another terrible tragedy; the mass shooting in Oregon filled our lives with the horrors of death, and the stories of courage, love and compassion that came from it. It seems that year after year we read of the tragic deaths of men and women who are fed up with life. They have reached the end of the ropes; their hearts are filled with self-loathing, hatred and anger. They may take the lives of others and then in a final act of despair, take their own lives. This spirit of self-hatred has to be the Number 1 spiritual disease in our nation, driving people of all ages to give up on life. All of us find the seeds of this deadly disease in our own lives to some degree. Now and then we hate what we see in ourselves and fall out of love with life by being depressed and bitter towards all close to us. How often we put ourselves down as being of little value. We can trace most of our unhappy moments back to this self-hatred. The sure cure is found in appreciating yourself as a lovable and a loving person. No matter what mistakes you have made or what failures you have endured, you are still of precious value. Say often each day, possibly as you look in the mirror: “I love you. You are a great person. I care tremendously for you.” Remind yourself of the many good things you have done in the past. Think of your special gifts and talents; each one has these. You will be astonished how this sincere respect for yourself will bring instant results. A new peace of heart, a renewed spirit of confidence, along with a strong desire to reach out to others will come into your life. Do you have members of your family in a state of minor depression? Keep telling them how lovable they are, how special their gifts are! You will see a change. When correcting faults of children, be sure to isolate the fault from the person of the child. Condemn the fault, but not the person behind the fault. Believe me, each one of us is simply great – without exception!